You are here: Home / Current Events / Are You Ready for the LeaderShift? I’m excited for my new book, LeaderShift, and I think it’s incredibly important. In short, it’s going to up to people outside of Washington to fix America. That means you and me, and others who really care about freedom. Politicians just aren’t going to fix our problems, not in Washington, Ottawa, London, Sacramento, Albany or anywhere else. If things are going to get fixed, the leadership will almost certainly come from business leaders, family leaders, and regular people who do what it takes to make a difference. Just like during the American founding. Except this time it will be a war or words rather than militaries. The truth is that a LeaderShift is coming. The big question is, are you ready for it? Is your business or career ready? Is your family ready? The historical switch from kings and chiefs as the top leaders to community fathers such as doctors, lawyers and town merchants. The 1880-1920’s transition from city fathers as the main leaders to titans of industry, like Carnegie, Morgan and Rockefeller. The 1940-1970’s shift from business tycoons as the top leaders to managers, spurred by the work of Edward Deming and innovators from Jack Welch to Sam Walton. The 1980-1990’s transition from managers to leaders, influenced by sages like Buckminster Fuller, Earl Nightingale and Stephen Covey. Right now we are in the early stages of another great transition. This time, the shift is from political leaders as the top leaders to successful parents, teachers, business leaders, and other regular citizens standing up and making their influence and leadership talents felt in leading society. This isn’t a partisan book. In fact, political parties are at the center of the problem, and what is needed to really get our nations back on track is for business and regular people to start making a bigger difference. The book hinges on Five Laws of Decline, each of which is currently chipping away at the strength of many institutions, including government, family and business organizations. Executives, entrepreneurs, parents and others who don’t understand these Five Laws, won’t know how to overcome them. And until non-politicians learn about and respond to the Five Laws of Decline, the economy will continue to face overregulation, over-taxation and growth-killing uncertainty. 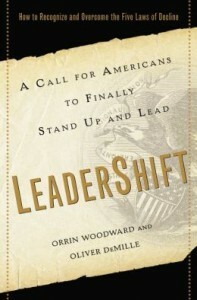 LeaderShift is written as a fable, where the lead character is a successful business leader who realizes that politicians aren’t likely to fix our economy any time soon and sets out to find a solution to America’s decline. In the process, he applies the wisdom learned from years in business and from many of the greatest business books, puts together a team of business people to deal with our national problems, and creates a plan of how to really fix America. When the team gets help from a surprising supernatural source, what happens next is a story you’ll want tell and retell. And the solutions in the book are a unique approach that can really work. For years people have asked me how we can really fix America, and in this book I finally answer this question. Orrin and I list 9 specific changes that need to occur in our world. If they do, we’ll fix the nation. If they don’t, the decline will continue. Freedom matters, and the future of freedom is simple. We need to fix our addiction to big government, put free enterprise incentive back at the center of our economy, and give real freedom a try. Freedom works. Until we return to freedom, our trend of ongoing national crises and decline will just keep getting worse. It’s time for a real fix, and it’s only going to come from regular Americans doing the important things that can put us back on the right track. Whoever you are, America needs you to be one of these new leaders. A LeaderShift is coming! Are you ready?